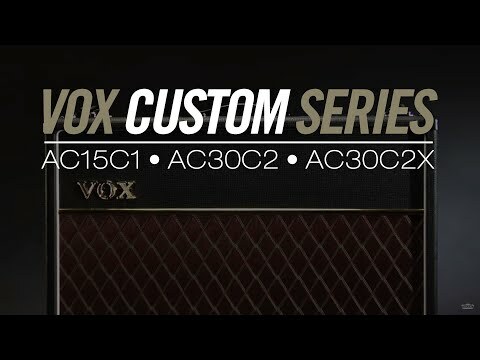 First introduced in 1958, the Vox AC15 combo has been the amp of choice for countless guitar players throughout the world. Drawing on more than 50 years of amp-building expertise, the AC15C1 Custom Series offers maximum tonal dexterity. The AC15 combo makes use of 3 x 12AX7 preamp tubes and uses pair of EL84 tubes to drive a single 12" Celestion G12M Greenback. All models in the Custom Series offer a switchable 8/16 ohm output jack for powering an external speaker cabinet when you need to speak with a little more authority; using this jack will mute the internal speakers. Additionally, a 2nd extension speaker jack allows you to run an extra 16 ohm cabinet along with the internal speakers for a fuller sound. Posted on 18/02/2015 by Mr M. Hi, I have had two hours of playing this amp since collecting it today, with a fender tele and epi les paul. Both sound beautiful through the vox, the clean tones are crisp and each note easily picked out. When it is cranked the amp responds to your playing so that you are rewarded with a lovely break up, to classic crunchy British tones. Excellent amp, better than the ac30vr which I had to return. The service from the staff of Dawsons in Huddersfield has been excellent, above what would be expected and I would recommend them to everyone. Cheers. Posted on 15/06/2012 by derdom2000 This is my first tube amp and it's brilliant! I had a look at amps like the Blues Junior but this is massively superior! This amp has pride in my room!!! Posted on 15/06/2012 by Robert Great sound, through my tele & strat - very loud but has a master volume, so also ideal for home use! the tone is unreal - best amp avaliable at this price. A must buy!!! Posted on 15/03/2012 by Handsome Devil Great sound, build quality and well....it`s a Vox! Nuff said!